Judging by many of the 147 brass stars on the St Louis Walk of Fame, the city has, over the decades, nurtured the talents of a number of its residents, who have gone on to make a significant contribution in such diverse fields as literature, sport, entertainment, science, journalism and music. Maya Angelou, Tina Turner, Chuck Berry, Scott Joplin, Tennessee Williams, TS Eliot, Kevin Kline, Josephine Baker, Vincent Price, Robert Duvall, Charles Lindbergh, Joseph Pulitzer, Jimmy Connors, Jackie Joyner-Kersee... These were simply the first names which leapt out at me, the first time I looked at the list. Others are maybe only famous locally, or to fans of particular sports or workers in a specific discipline; all were selected from a large number of nominations, to be one of only a few honoured each year. 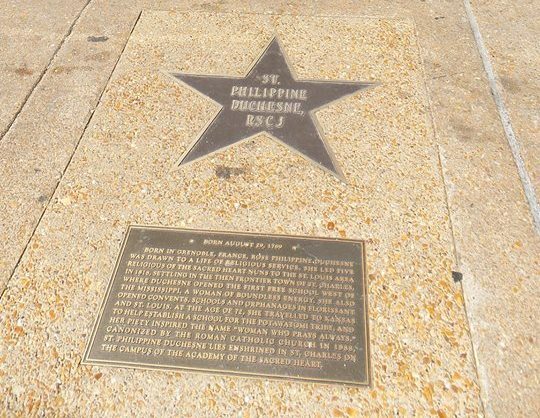 The newest star, unveiled on the Feast of the Sacred Heart this year, belongs to Philippine, currently the Walk's only saint, as well as one of its oldest inductees. The ceremony was attended by about 100 RSCJ, members of the Sacred Heart family and local Catholics, plus a ragtime band; though, as the St Louis Review commented, she would never have expected or wanted any of this, and would probably have wondered what all the fuss was about. During the forum two of us took a trip to Delmar Boulevard, keen to see it for ourselves. As we approached United Provisions we stopped to read a couple of citations - a WWII hero and a hockey player. And then we spotted the next star, and even from several feet away, I could see the St above her name, and knew we had found "our" star. 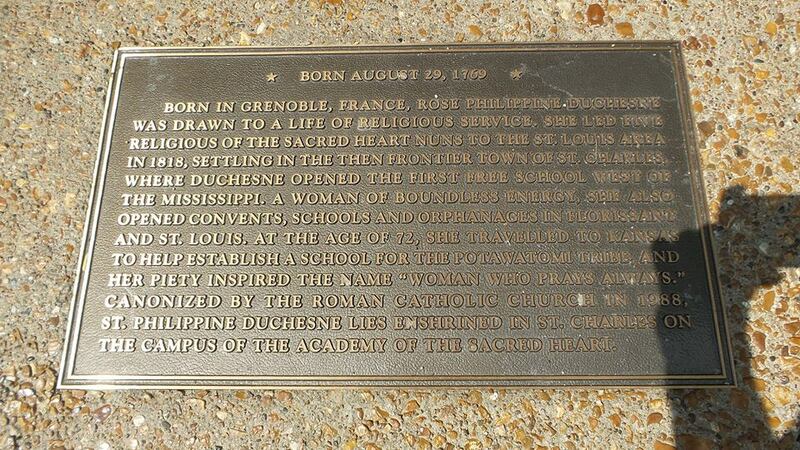 Quietly, we read the plaque, before taking photos. There was something quietly moving about seeing our Philippine, seeing St and RSCJ, Sacred Heart and Woman Who Prays Always, embedded in a pavement. It's one thing to see this recognition in a church or Society setting, quite something else to see it in an urban Walk of Fame: to know that here, Philippine rubs shoulders with feisty women like Tina Turner, Maya Angelou and Martha Gelhorn, as well as athletes, writers and entertainers with whom she would never normally be associated. It gives her a kind of universality; she isn't only ours, but belongs to a much wider world, even if it scarcely knows her - even if it walks over or past her. Here on a pavement, outside a shop and nowhere near a church or school, Philippine Duchesne, that wide-hearted missionary who lived only to make God known across new frontiers, and in new and different places, is continuing her life's mission - which for her must surely be a source of everlasting joy.